I was very excited when in February, having spoken to Greenwood worker, Mike Abbott, it seemed like I was in with a chance of working with him this summer. “Come and help set up the new workshop and we’ll see how it works out,” he said. Mike had decided to move from his co-operatively owned woodland, Clissett Wood, to the new rented site of Brookhouse Wood about 8 miles away. So before I was to learn anything about working with greenwood I had to earn my stripes working with the six strong team to build, amongst other things, a 500m long track. This involved a crash course in driving a dumper truck and a vibrating roller. It was not what I’d expected, but was an interesting and valuable experience all the same ! Other interesting jobs that were done during the setting up process were making a set of Chinese bellows and building an impressive multi-purpose wood burning stove, which, once finely tuned, did all the jobs: boiling kettles, raising and baking bread and drying and steaming chair components, all from one easily manageable fire. I had a brief insight into green oak timber framing when Sussex carpenter Dave McKenzie arrived to help build what must be the smallest cruck-framed building in Herefordshire, a very grand compost toilet ! The first month went well and I was delighted when Mike invited me to stay until September as his course assistant. I was also told that Woodland Heritage had very kindly agreed to help with funding for training and craft skills over this time, for which I am very grateful. One week before the first course began, we went to the Association of Pole Lathe Turners annual event, The Bodger’s Ball, which was held at Formby, Merseyside. I met many greenwood enthusiasts and saw some interesting talks and demos. I also witnessed my first ‘Log-to-Leg’ race – in which participants compete to produce two identical chair legs as fast as possible from a log, using the polelathe. The first course was three days long, “An Introduction to Greenwood Work” and a good introduction for me. It was also useful to try out the new workshop facilities and see what still needed to be done and what should be changed. 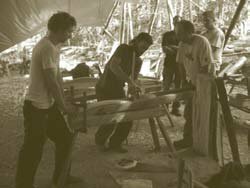 Then there was a six day bark-seated chairmaking course which was very interesting. This included spending half a day in the woods felling and stripping bark off some Wych Elm trees which we later cut into inch-wide strips to use for seating the finished chairs. I saw for the first time the brilliant technique of joining chair components together using the natural shrinking properties of greenwood. Oval tenons were produced and then forced into round mortices giving an incredibly strong joint without the need for glue. I was keen to try my own hand and found the time to make a Shropshire-style nursing chair from Wych Elm, which I turned on the pole-lathe. This increased my confidence and really helped me understand the processes involved and made helping other people to make their chairs a lot easier. Mike always took the opportunity to call me over when there was something being done in the workshop which I hadn’t seen before. This was great as it enabled me to get a good idea of all the different ways to do things. Mike had been asked to talk at the Forest School Wales AGM near Newtown, and invited me along too. I hadn’t heard of Forest Schools before and was interested to find out more. Forest Schools encourage schools to bring children out of the classroom and into the woods to learn tree identification and basic woodland skills, as part of the weekly curriculum. This was my first realisation of how important it is to encourage and promote the teaching of woodland skills and knowledge from one generation to the next. That is my responsibility too ! A couple of weeks later I attended the Woodland Heritage Field weekend in Welshpool and was struck again by “responsibility” when I heard about 150 year management plans needed to produce high quality slow-growing hardwoods. A management plan which would stretch over several generations of foresters. I met many knowledgeable people who were interesting to talk and listen to. The weekend gave me a glimpse of the world of woodland management and many aspects that I hadn’t considered before. Back at Brookhouse Wood the teaching and learning continued. I made my second chair, a more ambitious five slat arm chair from ash. I became more comfortable with my role on the courses and felt at ease with the lifestyle, finding earwigs in my coffee, living in the woods and sometimes not seeing a soul for several days at a time. Our next outing was to be the South West Woodfair near Oakhampton in Devon. Working alongside Mike, this was my first show with open contact with the public. I enjoyed answering questions and explaining what I was doing. I entered my first ‘Log-to-Leg’ challenge and won 3rd prize after Mike and Ben Orford. The next day was spent with a group from The Smallwoods Association visiting some local woodlands and seeing what people were doing to make their woods viable through valueadding by offering family days out and as a venues for education, such as the Forest Schools. In the middle of the summer we thinned out the trees around the workshop to allow in more light and then spent a few days with a friend of Mike’s called Dougie in the nearby wood, felling more wych elm and collecting the bark. It was hard work in hot weather and the horse flies were bad, but it was satisfying and we got a lot done. In the same wood there was a full-time forester who had been felling Western Red Cedar and thinning some ash. The ash was perfect for what we wanted and he had tonnes of it, so we bought some. He told us he was getting £14 a tonne for it and it would be taken for pulp and used for making corrugated cardboard. He was using a harvester and a forwarder and said he spent £800 a week on diesel and £10,000 a year on insurance. We were at totally opposite ends of the scale. I felt very small; the three of us with our drawknives and a chainsaw, felling and stripping a few trees – and him with his giant machines felling hundreds. Yet the value of our products at the end of a day was probably quite similar. The contrast was amazing. In August we were joined by Franz who had also come to help out and learn as an assistant. It was great to have a constant personality in the wood and someone to share the workload in the workshop. It was also good motivation for each other using all our spare time to make things and to discuss and experiment with our own projects. Towards the end of the summer Mike stepped up our responsibilities by getting us to take turns doing the introductory demonstrations at the beginning of each course. This was nerve wracking at first, but was very useful and steepened the ‘Learning Curve’ again, forcing us to think carefully how to explain the processes we’d been taught, simply and clearly – resisting the temptation to try and explain too much too soon. This was also great for cementing what we’d learned and I came to really enjoy teaching. On the last day of the last course, Mike had organised for me to do my first show on my own near Southampton. So I spent a week making my own shave horse and pole-lathe, got a selection of tools together and set off for what felt like my final test. The weather was good and the site was right on the quay-side in Hamble-le-rice. There was a lot of interest from passers by and a lot of questions being asked. The most interested were the children, who never seemed to run out of questions, but were more fascinated by the woodshavings I produced than what I was actually making! The day was good and encouraging for the future. I think back over the summer and realise what a great experience and opportunity this has been. I feel I’ve learned lots and have been shown many routes that I can go down from here. Routes which I knew nothing about 6 months ago. As a result of working closely with the raw material and what I’ve seen this summer I have become increasingly interested in how trees grow and how woodlands should be managed. So I was very pleased to be offered a place with coppice worker, Ben Law, in West Sussex this winter.